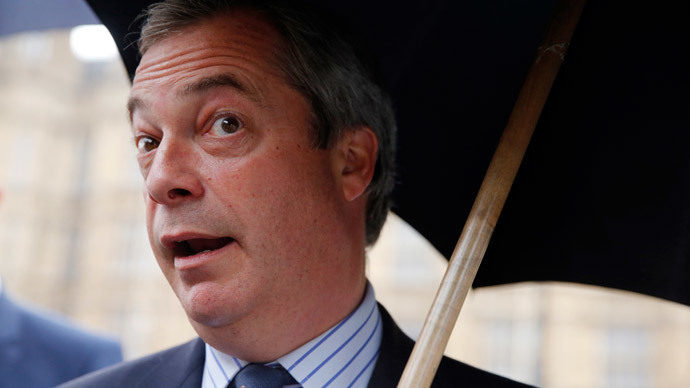 UK Independence (UKIP) chief Nigel Farage has said he wants to lead the Euroskeptic party for the next 20 years. The statement, given to a national newspaper on Sunday, came after Farage survived a week of intense wrangling within the party. A bitter row developed in the wake of the general election when Farage decided to withdraw his resignation, and continue as leader. UKIP Deputy Chairman Suzanne Evans insisted Farage wasn’t being serious. 2035. An elderly Nigel Farage, coughing heavily, wheelchair bound, once again asks to leave UKIP, but is denied. “I think it's a joke,” she told the BBC, before suggesting the UKIP leader take a break. UKIP’s only MP in Parliament, Douglas Carswell, echoed Evans’ comments when he clarified a previous statement that appeared to suggest he wanted Farage to resign. Carswell defended the party’s decision to reject Farage’s resignation following his defeat in South Thanet in the general election on May 7. “Clearly the national executive has the authority, they're the ruling body. I'm told that they made a decision. I'm told it was a procedurally correct decision, he is the leader but I think it's important that as leader he takes a break and I think it's important that we work out how these complex questions are answered by a team,” he said. Farage’s decision to return as UKIP leader, despite having promised to quit if he was not elected in South Thanet, caused a violent rift in the party. In addition to O’Flynn’s biting criticism of the party leader, wealthy donor Stuart Wheeler and former UKIP Member of European Parliament (MEP) Godfrey Bloom called for Farage’s resignation. Two of Farage’s closest aides quit after the party machinery blamed them for the ‘shock and awful’ campaign strategy, which alienated moderate voters. The pair left UKIP the same day, signaling an end to the worst of the party’s civil war. Faith in Farage was buoyed last Thursday when influential donor Richard Desmond, owner of the Daily Express newspaper, came out in support of the beleaguered leader. “Nigel has my support 101 percent,” the Daily Express quoted its owner as saying.